Anyone expecting a detailed account of the life and times of Wat Tyler, who famously led the revolt of 1381, will be disappointed for this book, as the author makes clear at the outset, is a cultural history of the man and the revolt. There is a short chapter providing the reader with the salient facts, and if more than this is wanted, then the author points one in the direction of Dan Jones’s best seller of 2009, Summer of Blood: The Peasants’ Revolt of 1381. So in fact most of the book is devoted to the study of how the legend of Wat Tyler has been received through the ages, and in fact this enquiry proves to be both entertaining and enlightening. 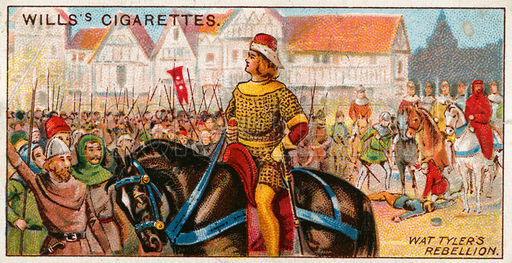 The author skips over the late medieval period during which time Tyler and his army are depicted, we are told, as “ungodly wretches seeking to overthrow the divinely established social and political order”, and so he begins with the early modern period (from the reign of Elizabeth) when a play more sympathetic to the rebels was published which incorporated the legend that the revolt was initiated after a poll tax collector was done to death for an indecent assault on Straw’s daughter made on the pretext of checking whether she was under sixteen (in this play Straw is mixed up with Tyler). Also during this period a number of Elizabethan ballads covered the subject in the form of broadsides and garlands (where broadsides are the singles and garlands the albums) but these returned to an antagonistic portrayal, perhaps because ballads were not, as is commonly believed, the songs of the common people but rather “part of a popular culture which people from all classes enjoyed”. During the Civil War two works appeared both of which regarded the revolt as a warning from history, and the later of the two by Cleveland depicted “men such as Wat Tyler and Oliver Cromwell , who seek to overturn existing hierarchies, …like demons from Hell”. Of Cromwell the author notes on more than one occasion that he is a little surprised that the Lord Protector did not make use of the legend. Surely the reason for this is that Cromwell was far from being a radical, as is clearly demonstrated by his words at the Putney debates and his crushing of the Army Revolt. The gin soaked eighteenth century was a time of English riots, and it was perhaps alarm at the prevalence of King Mob, which caused the splendidly entitled The History of All the Mobs (1715) to be written since “of late some people have been stirred to riots”. Basdeo describes the work, which cost 6 shillings, as resembling an eighteenth century criminal biography. The indecent assault is again the catalyst for revolt since the poll tax gatherer offers “some rudeness” to Tyler’s daughter and is felled by a blow on the head. The book is free with its facts, concluding with a fake excerpt from Jack Straw’s confession that “in the same night that Wat Tyler was killed, we intended to set fire to the city in four corners….”. So fake news was alive and kicking in 1715! Of course the press of the time was quick to resurrect the phantom of Tyler after the Gordon Riots of 1780, describing the fundamentalist Protestant Lord George Gordon who instigated days of complete mayhem in London because of some mild reduction in Catholic persecution contained in the papist Acts of 1778, as “of higher quality’” than Tyler. It was only with the French Revolution in 1789 that the spectre of a real revolution in Britain came to properly scare the establishment. The Times of September 1789 described the Parisian insurgents as “in the same habit of mind which possessed Wat Tyler and his levelling companions…” Of course many Englishmen initially welcomed the Revolution, including Edmund Burke. He, of course, did a complete volte face, as much because of the anti-religious turn of the Revolution; his Reflections prompted the famous response of Thomas Paine’s The Rights of Man, which attempted to rehabilitate Tyler by declaring that ”the nation owed much to his valour” and by providing a potted history of the events of 1381. At this point of his career Paine was lauded both in America (without Paine would the American War of Independence have succeeded?) and France, and the book was hugely popular and did much to stimulate the growth of early English radicalism. The response of the English government of the day was to bring charges of sedition against Paine which caused him to flee to France (where he was elected a deputy in the Convention and narrowly escaped the guillotine), and also to initiate Pitt’s Terror, which involved numerous arrests of radicals and even the suspension of Habeas Corpus. Radical societies like the London Corresponding Society battled on, but the Government’s highly effective system of spies won the day. It was during this period of repression that Robert Southey wrote his long poem Wat Tyler, which depicts Tyler as the champion of the oppressed. No doubt because of the fear of arrest the poem was never published, and the poet forgot his youthful enthusiasm for “the fire of justice”. In fact by the time of his middle-age he was a Tory and Poet laureate, and when someone got hold of the manuscript and published the poem, Southey was roundly mocked as a hypocrite. The first part of the nineteenth century was taken up with the growing demands for electoral reform. At first the governments position was intractable, and even the Peterloo massacre of 1819 did not evoke any lessening of despotism. As the century wore on the Chartists grew in number, but the movement petered out in 1848. Some Chartists had made use of the Wat Tyler legend and a book by Pierce Egan sold widely; but there was no real backbone in the movement which contented itself in 1848 with delivering a petition to Parliament and accepting the Government’s dictat banning its meeting. In the second part of the century, the legend was turned into a popular albeit racist and imperialist book by G.A. Henty, but it was only with the arrival of socialism that a more long-lasting literary legacy appears in the form of William Morris’s A Dream of John Ball which according to Basdeo represented “the beginnings of socialism”, and indeed contains a utopian vision where the de-frocked priest and Tyler’s co-leader speaks in a dream to a traveller from the nineteenth century, hoping that “at last all men labour and live and be happy”. Both Morris and Ball would then no doubt be disappointed to see how things actually panned out. In the twentieth century the legend lies mostly dormant; apart from one 30 minute film, no great screen epics are made, and it is only with the arrival of Margaret Thatcher’s hated poll tax of the 1980’s that the name of Tyler is once more evoked with real passion as the post-war consensus breaks down, with the somewhat ludicrously named MP Jack Straw calling for resistance to the charge. There is much to admire in this book, containing as it does material from a forgotten cultural history, and showing the way the literature of different ages have responded to the legend. Basdeo has an easy reading style, and although the theme is by its very nature somewhat repetitive, there is plenty of interest in these often forgotten literary pieces, and the author has contrived to pursue a single theme throughout in both a scholarly and entertaining fashion. – Robin Carlile.